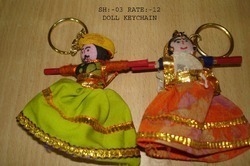 rajasthani kaka-kaki keychain available in each size. We are offering Tweety Keychain to our clients. 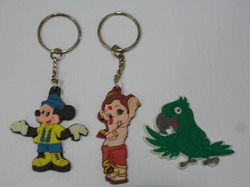 We are the leading trader, wholesaler and supplier of beautifully designed CartoonKey Chain. An assortment of these meticulously designed cartoon character key chains includes Mickey Mouse, Donald Duck, and Tweety. The offered range is tested on various parameters in order to ensure the quality and durability of the product. Clients can avail the entire range at market leading prices. This PVC Key chain in the character of Simba is made of high quality PVC with detailed printing and comes in a card and cellophane packing. This key chain is perfect as a gift or return gift for a birthday or Kitty Party. We are the manufacturers and suppliers of beautifully designed cartoon character key chains. An assortment of these meticulously designed cartoon characters key chains include Mickey Mouse, Donald Duck, Tweety, and many more.